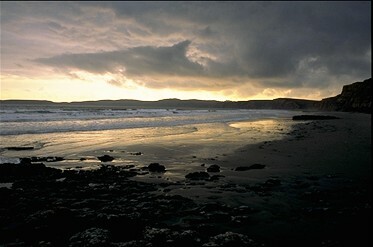 About an hour and a half north of the Golden Gate Bridge, Drakes Beach is a _beautiful destination for a beach walk or picnic. I often take out-of-town guests there. The beach is long, flat and narrow, facing southeast and stretching for miles directly below sandstone cliffs. Drive-up access, a small café (not always open) and a visitor center make it a pleasant day trip. Although it can be pretty crowded on weekends, once you get away from the parking lot, the crowds thin out. You can either walk along the beach, or along the top of the cliff, for beautiful views of Drakes Bay and the headland that houses the Point Reyes Lighthouse. From the lighthouse (open Thursday through Monday), you can view harbor seals and sea lions, in addition to a large variety of coastal birds. Mountain bikers also use the trail. Sir Francis Drake thought that the cliff that rise above Drakes Bay resembled the white cliffs of Sussex, prompting him to name the place Nova Albion (new Britain). The cliffs provide shelter from the usual northwest summer winds. The sands of the Drakes Bay cliffs were deposited in a shallow sea 10-13 million years ago, compacted, then uplifted. Erosion has revealed the striations of this story in the cliff faces. The cliffs are part of a large body of sandstone called the Drakes Bay formation. Wave action over thousands of years has cut deeply into this soft formation, leaving a series of cliffs and valleys. Drakes Beach is rarely soarable, but if you catch it on the right day, you can ridge soar along the cliffs. The wind must be from the Southeast, which really only happens in the winter. Be careful of the rotor, as the cliffs are relatively steep and be mindful of the tides. Flying is permitted north of the parking lot and is prohibited south of the parking lot. There is a paved trail that leads to the top of the cliff. You must must register with the Dispatcher's Office at the Bear Valley Visitor Center, in the Point Reyes National Seashore, prior to flying at Drakes Beach. The Visitor Center is open seven days a week and someone is usually in the dispatcher's office seven days a week. It's a good idea to call first (415.464.5100) to make sure that there will be someone there to give you permission. (Please be extra friendly and polite to the Dispatcher!) The dispatcher's office is located in the first building on your right as you drive into the Visitor Center compound. Look for a white clapboard building with a U.S. flag flying out front. Signage is sparse, so ask a ranger if you have trouble finding the right place. A P3/H3 is required and registration is good for one year. You don't have to sign-in each day you fly, but you should a carry a photocopy of your signed registration form.